Insight Meditation: Biography of Chanmyay Sayadaw. Ashin Janaka was born in Pyinma village, Taungdwingyi township, on Tuesday 24 July, 1928. His parents were U Phyu Min and Dhw Shwe Yee. At the age of 15 he was initiated at the Tawya Beikman Monastery as a Samanera (novice monk) under the tutelage of the Abbot, Ven. U Malvamsa receiving the name of Shin Janaka. He delighted in the study of Buddha-Dhamma devoting his whole time to studying the scriptures. After that, he continued his studies of English under Myaung-mya Sayadaw U Dhammananda of Pathein and returned to Mandalay Mahavisuddhayone University to fulfil his duties as a lecturer in Buddhist scriptures. In 1954 he was invited by the state Buddha Sasana Organisation to perform Palivisodhaka (editorial duties. In 1957 the Ven. Sayadaw spent nearly six years at Mahavisuddharma Monastery, Colombo, Sri Lanka, where he continued his studies of English, Sanskrit, Hindi and Sinala language. While at Colombo he took the London G.C.E. (A level) examination and passed. He returned to Burma in June 1963, and at the invitation of the state Buddha Sasana Organisation, he took up residence at Kaba-Aye where he edited the publications of Pali Texts. In 1967 he performed the duties of Nayaka Sayadaw (Meditation Teacher) at Mahasi Sasana Yeiktha Meditation Centre under the instruction of the Most Venerable Mahasi Sayadaw and rendered assistance in the performance of Piriyatti (studies) and Patipatti (meditation practice) duties. In the field of Patipatti the Ven. Ashin U Janaka performed the duties of Meditation teacher at Mahasi Sasana Yeiktha for five years and at Mandalay Yatanabon Sasana Yeiktha for about one and a half years. In February 1979, the Venerable Sayadaw took up residence at Chanmyay Yeiktha Meditation Centre which was donated to him by a number of devotees, and spared no pain in performing the dual duties of Meditation Master in Patipatti as well as Pariyatti. He has been since then, known as the Chanmyay Sayadaw. 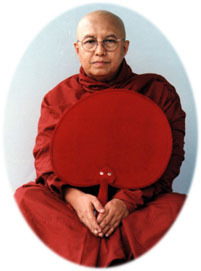 In 1979 - 1980 he accompanied the Most Venerable Mahasi Sayadaw's Dhamma Mission to Europe and the U.S.A. Between 1981 and 1985 he undertook Dhammaduta missions alone to twenty countries in Asia, Europe and the United States. From April 1979 to July 1995 the Venerable Sayadaw conducted several meditation retreats and delivered Dhamma Talks in twenty-five countries in Asia, Africa, Australia, Europe and the U.S.A. In April 1995 some devotees in Hmawbi and Yangon donated the Sayadaw a ten-acre plot of land near Hmawbi to set up a meditation centre. The land is quiet and cool, with many big shady trees. On this land the Sayadaw's disciples have been constructing dormitories, meditation halls, meditation platforms, kitchens, dinning halls, etc. In honour of Sayadaw's missionary work for the cause of the Buddhasasana, the Government of the Union of Myanmar conferred on him the titles of 'Maha-Kammatthanacariya' (Great Meditation Master) in 1993 and 'AggaMaha-Kammatthanacariya' (Great Noble Meditation Master) in1995.